Allergies, also known as allergic diseases, are a number of conditions caused by of the immune system to something in the environment that usually causes little problem in most people. A damaging immune response by the body to a substance, especially a particular food, pollen, fur, or dust, to which it has become hypersensitive. Common allergens include pollen and food. Symptoms of food allergy include abdominal pain, bloating, vomiting and swelling of the skin during hives. Effective management of allergic diseases relies on the ability to make an accurate diagnosis. 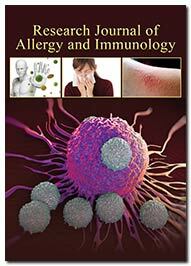 The Research Journal of Allergy and Immunology (RJAI) covers in the field of allergy and clinical immunology. It publishes high-impact, cutting-edge clinical and translational research papers for allergists, immunologists, dermatologists, gastroenterologists, and other physicians and researchers interested in allergic diseases and clinical immunology. It brings timely clinical papers, instructive case reports, and detailed examinations of state-of-the-art equipment and techniques to clinical allergists, immunologists, dermatologists, internists, and other physicians concerned with clinical manifestations of allergies in their practice. This Journal of Allergy and immunology is a peer-reviewed, open access journal that publishes original research articles, review articles, and clinical studies in all areas of allergy. Chief criteria for acceptance are scientific novelty and quality, originality, clarity, and conciseness with early online publication, regular podcasts and an immense archive collection. Journal of Allergy and Immunology supports the scientific innovation and advancement in vaccines including biological preparation that improves immunity to a particular disease to the process by which an individual's immune system research community by increasing access to peer reviewed scientific literature.